Tampa native Andrew Valins portrays the titular character in "The Mackenzie Dylan Show". Drew has worked on the NY stage for eight years in productions ranging from classical to contemporary to commedia and clown. He has worked with Anne Bogart (Columbia Stages), Bonnie Monte (Shakespeare Theater of NJ), The Vital Children's Theater, and Jef Johnson of Slava's Snowshow, as well as with countless Columbia Film Graduate students on their projects and is the star of the upcoming web series "The Mackenzie Dylan Show". Drew tours his solo show: A Report to an Academy (based on the short story by Franz Kafka) in which he plays a humanized ape. His principal training is with the Shakespeare Theater of NJ, Dell Arte School of Physical Theater, Anna Brennen and Stageworks Theater, Michael Howard, Larry Singer, Jef Johnson, and the streets of NYC. 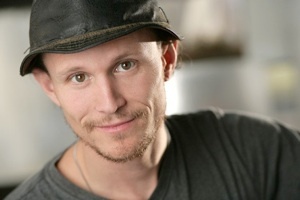 For More details, please visit www.drewvalins.com for the frequently updated blog of this amazing actor's current projects.